We are very satisfied with the service provided by your plumber David. The work consisted in replacing the valve cartridge and the wand with its hose in the MOEN kitchen’s sink faucet. David did an excellent work, was very professional and kind, also was good in negotiating the price for the service rendered to our satisfaction. We highly recommend The Pink Plumber to anyone looking for plumbing services. David the person assigned to perform the assestment of our issue was very profesdional and knowledgeable. He explained the problem in a clear manner and how the repair would be performed. He completed the job as promised with no surprises. I would gladly use the Pink Plumber in the future if needed. Very prompt and friendly service . Explained in detail what was needed to get done and did the job quickly. Very happy with the end result. David was very knowledgeable about our problem and did a very neet Job. Well it lasted 1week, and we paid 250.00 for this diagnosis and repair. We were told this would solve the noise, but it didn't. Pinks is reliable, responsible, reasonable, knowledgeable and that's no "bull". Seriously, I picked Pinks out of the phone book years ago and have never regretted it one bit. They have serviced my home for several different plumbing issues in the last 7 yrs. Every appointment is set-up in a 4hr window span and most convenient to my schedule and need. The service dept calls within an hour of the targeted arrival time and techs are prompt. Depending on the service needed we have been given options if available. This current visit David was very informative of my options, if this fix (my request for cheapest & easiest) does not solve the problem long term. He went above and beyond finding options more than just the usual either or choice most customer service departments offer nowadays. My only disappointment is they do repairs, but not remodels, my final fix. Dave is great, the company is customer service driven, their pricing is comparable to most and financing is available. What more could you want? Dave was very nice, very knowledgeable and he was a special request (he did work for my daughter). I really appreciate how hard he worked! Thank you, Dave! Once again, great job! Excellent service. High quality work. Trustworthy. Exceptional customer service. Clearly and accurately explains the problems and options to resolve the issue. Our water heater was out. After a day of cold showers, The Pink Plumber was able to respond quickly and resolve the issue. Professional, quick, and reasonable. We couldn't have been happier with the service! Fast reliable and friendly service! We are happy! Nothing but good things to say bout my service! David L did an amazing job! Was a nice guy, didn't mind my messy cluttered house, was nice to my dogs & kids, just all around great experience. The price was a little more then other places I quoted but was a rush job & so I picked Pink Plumber. I'm glad I did! Thank you David! We had an overnight plumbing emergency the night before an early-morning surgery was scheduled. 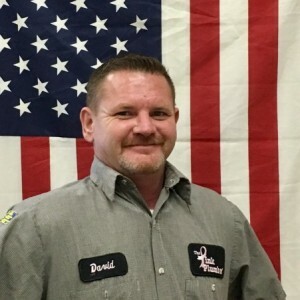 David L. was timely and able to correct our issue that night so we could return home the next day after surgery to working fixtures. He scheduled the completion of the job for later in the week, was very professional and thorough in his work, and will be highly recommended by us! David did a great job fixing our leaking shower by replacing the valve system and new Moen handle with shower head. I appreciate that he was able to come out quickly on a Saturday. David was professional, polite and informative. Seems like the kinda guy who'd help find your lost dog, really helpful. The ladies on the phone weren't half bad either. They put a smile on my face. Blessings.